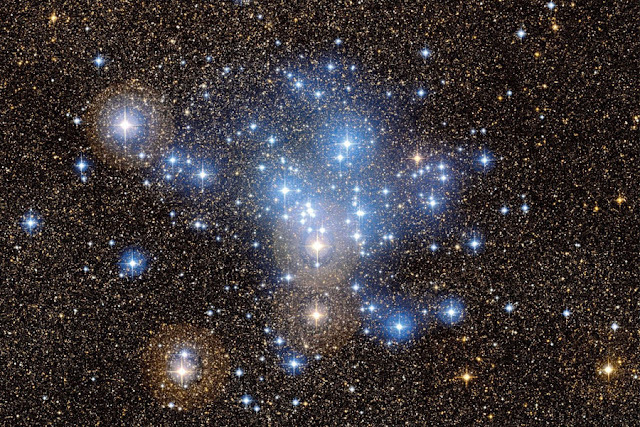 An Ancient Solar System...: How bright is it inside a star cluster? How bright is it inside a star cluster? I've seen a hell of a lot of pictures of star clusters from telescopes - generally they look like very beautiful things. But I've always wondered... what would one look like from inside? In a dense cluster you can often get dozens of stars within a fraction of a light year of each other. When the stars are mostly Sun-sized such a cluster would be a very beautiful pace – the sky would sparkle like a box full of diamonds. But in a big, young, star cluster the stars are more likely to be huge, O-type supergiants that weigh dozens of times the mass of the Sun and put out hundreds of thousands of times more energy. The brightest clusters, like NGC 2070 in the heart of the Tarantula nebula will pack hundreds of O giants and dozens of monstrous Wolf Rayet stars – hugely unstable stars weighing hundreds of times more than our Sun and giving out millions of times more energy – into a few cubic light years. In fact the central region (just knownas ‘R136’) of the NGC270 cluster contains a dozen gigantic stars within a volume comparable in size to our solar system... Including a titanic star believed to be the biggest in our galaxy. 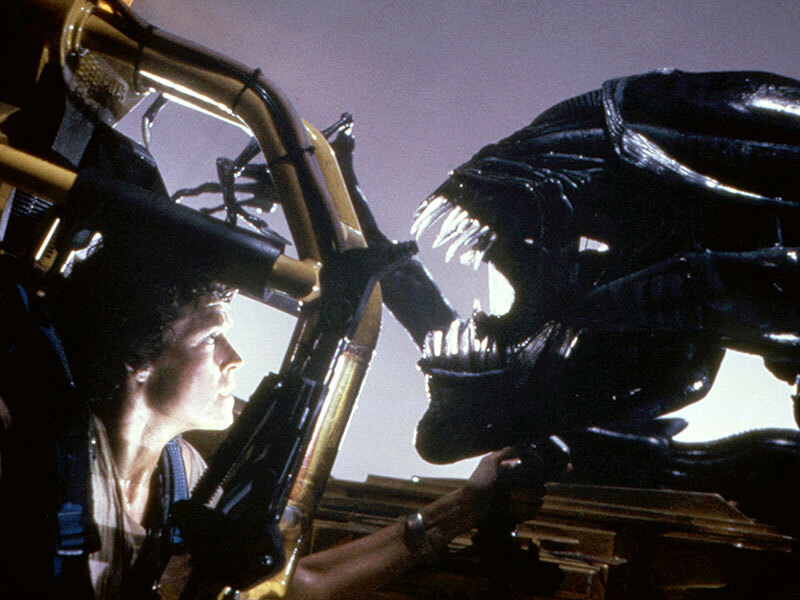 But let’s say you’ve got a spaceship, and you take it for a visit – what will you see? 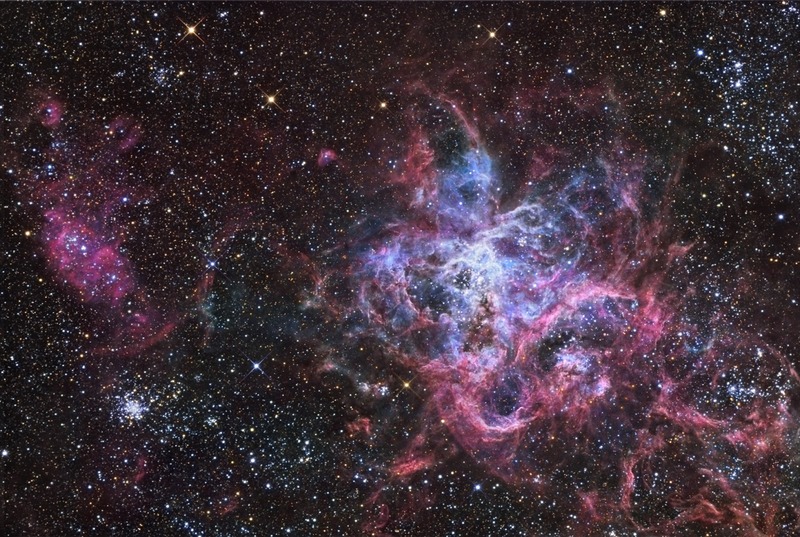 Above: The Tarantula nebula... as seen through a gigantic telescope. In fact, if you were to visit, you'd see far less of the nebula, and mainly just the brilliant stars in the middle. Courtesy of ESO. This would be less a sky full of jewels, and much more a sky full of hydrogen bombs going off. In the foreground, spaced evenly around you, will be incredibly intense points of blue light. They’re up to as bright as the Sun from Earth – but not in visible light: In high energy UV and X-rays. They are literally too powerful to give off most of their light visibly. Behind them is blizzard of stars that are dimmer, but still much brighter than any star in Earth’s sky, giving off the same high energy frequencies. The radiation is coming from everywhere in the sky – and that’s why you need to leave. Now. No, not because of all the Xenomorphs. Well... not just for that reason. See, in a densely packed cluster, it’s possible that even a space ship staying far away from every star could be receiving (according to my very, very, rough alculations*) five times the radiation output of a noonday Sun on Earth. That causes a big problem: On Mercury, which gets about seven times the sunlight Earth does, the surface temperature is around four hundred degrees Celsius. But Mercury has a nightside, so it can cool off. Above: Mercury - relatively chilled, with just one Sun to worry about. In the densest parts of a star cluster there isn’t a nightside, there’re radiation spitting stars in every direction. Your ship can’t lose heat by conduction or convection because, well, space - all it can do is heat up. This isn’t just a theory - getting rid of heat in space is a big engineering problem today, and that’s with just one Sun, at Earth-normal intensity. A cluster of giant stars would be a beautiful place: A sky full of brilliant sapphires. And if you stayed there too long, it would cook you. Above: A run-down on the new BEAM habitat, launched to the ISS by SpaceX on Friday. Courtesy of NASA. *OK, back-of-an-envelope time: In The Tarantula nebula the distance between the first and second brightest stars (8,000,000 times the Sun’s brightness and 6,000,000 times the Sun’s brightness respectively) is 5000 au (1 AU = 1 Earth-Sun distance) in total. Averaging their brightness to 7,000,000 Suns each, and putting our spaceship midway between them, makes them just over 1 x the Sun’s brightness from Earth, each. Why? Light intensity is inversely proportional to the distance from the source. So, since 1 AU is one Earth-Sun distance, our Sun at 2500 AU distance would have 1/ (25002), of its intensity from Earth, or 1 / 6,250,000th. Our super heavy weight star is 7000,000 Sun’s worth of brightness, so at the same distance it will have just over 1 Sun’s worth of intensity (6,250,000 / 7000000). There are twelve other stars in the same size range, at similar distances, in R136. Let’s be conservative, and say that those other stars only contribute a quarter of a Sun each on average, so 3 Sun’s worth. That’s still 5 times the energy of the midday Sun, pouring in from all directions. And this is before we’ve taken into account the effect of the rest of the cluster, which are further away, but much more numerous. Space: A blizzard of rocks? Eleven planets in our solar system? Starship drives, part 1: Sublight engines. What do other worlds smell like?